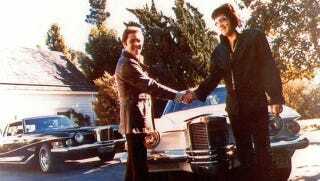 Elvis Presley's Gold-Plated Stutz Fired Up Like A King! Elvis Presley had a slew of cool (and also not-so-cool) cars, from scads of Cadillacs to the most famous of them all, the yellow DeTomaso Pantera he used for target practice. But he also had a taste for the obscure, and was actually the first owner of a Stutz Blackhawk. But he didn't just get one – he got four of those massive coupes in the early seventies. While James O'Donnell's first prototype was built by Ghia, the second car rolled out of Padane's garage, also located in Turin. That turned out to be Elvis' car, because while the owner of the Pontiac dealership, Jules Meyers, wanted to keep it on display, Elvis pointed out there's no better advertisement for the Blackhawk than him driving it around town. In the summer of '71, Blackhawk #002 was crashed by Elvis' chauffeur, and couldn't be fixed because the prototype's front was different from the later model's. So it landed in storage, and Elvis was without a Blackhawk until September, when he bought one of the production cars. In April of 1973, he went to see Mayers again, who happened to have a white Blackhawk in stock. The deposit was taken. But the King's favorite was his fourth, a Series 3 from 1973 with 230 horsepower, a burgundy leather interior and 18 carat gold plating everywhere. Because of course. The last photo of Elvis was taken before he left Graceland in that car on his way to the dentist, very late in the evening on the 15th of August, 1977. He died that next afternoon. Renowned Pontiac restorer Walt Hollifield has been working with Elvis Presley Enterprises to bring one of the King's Stutz back to life, and while it's certainly a great conversation starter, I'd go for his BMW instead. Because taste.